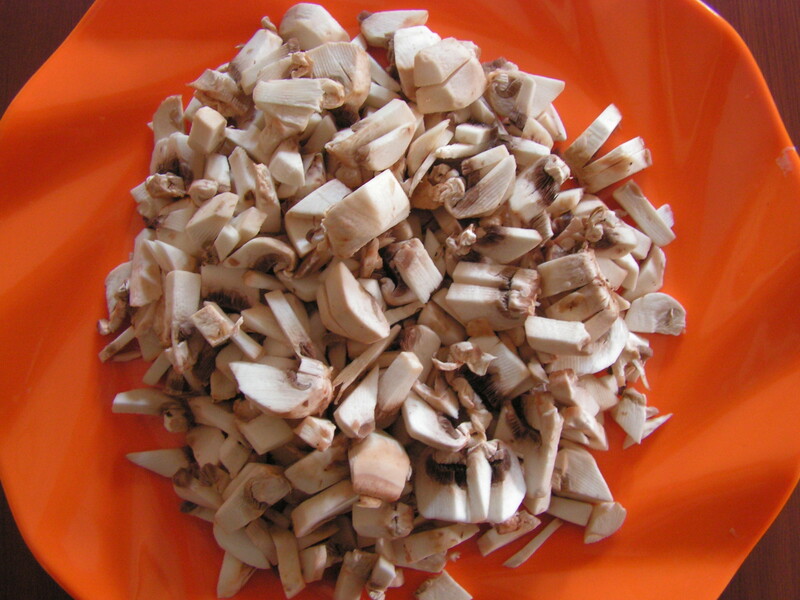 Mushroom, is available in natural as well as in artificial form. The natural ones are the button mushrooms available only on the arrival of the rainy season , when there happens to be heavy lightening, storm and thunder and is fresh and aromatic. Once the continuous rains start then it vanishes and we depend upon these artificial mushrooms only for sure. 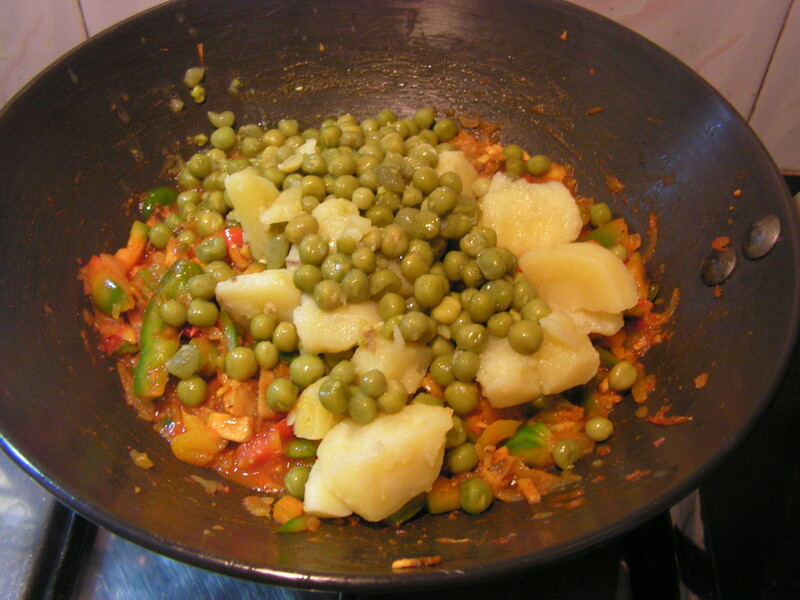 I have combined mushrooms with peas, Capsicum and potatoes for the dish. It is a good combo with either chapati or any roti of your choice. Here is my version of the dish. 1. 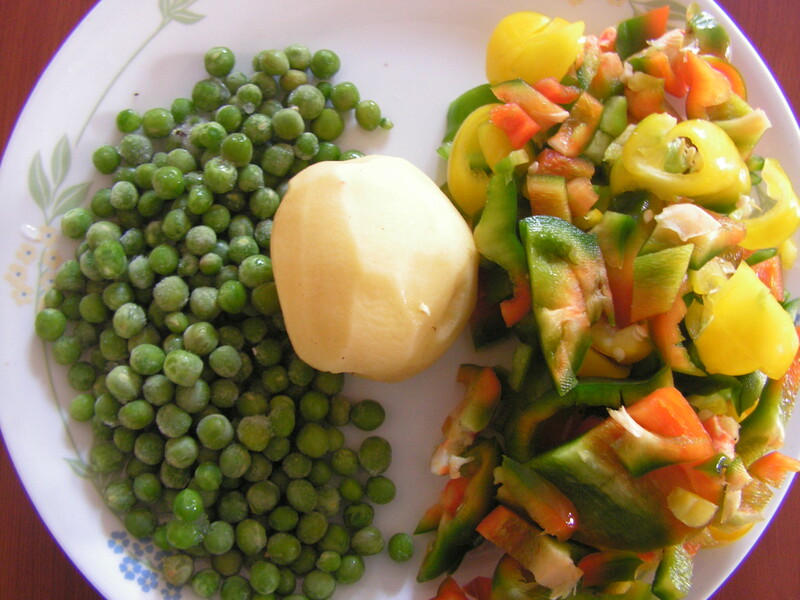 Wash and chop capsicum, peal potato and cook it along with peas in cooker till soft and keep it aside. 2. 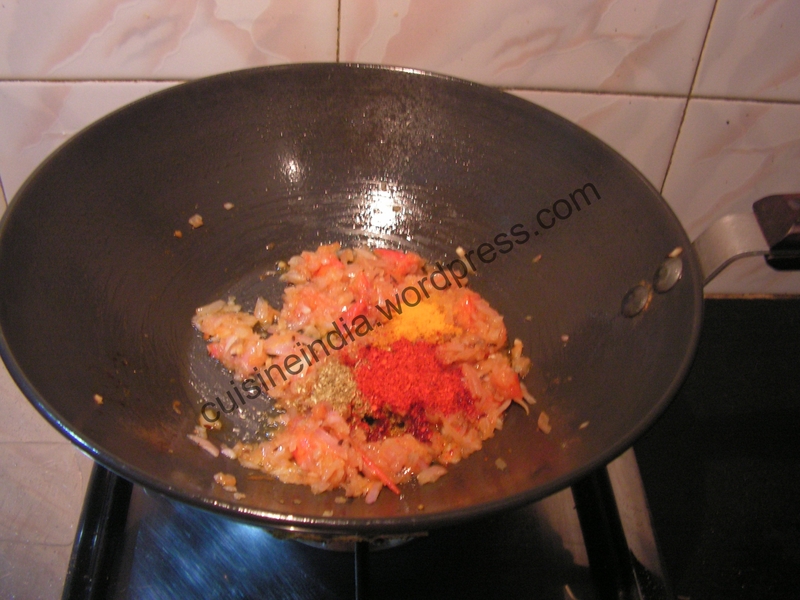 Wash, peal and chop onions fine, also wash and chop tomatoes fine and make ginger-garlic paste and keep it aside. 3. Place a skillet with 2 teaspoons of cooking oil in it on medium flame. 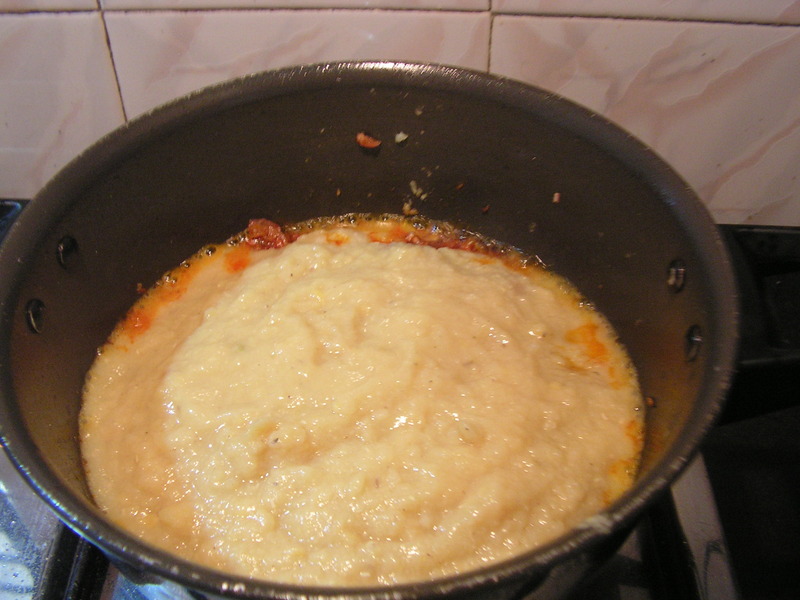 When heated, add chopped onions to it and fry till transparent adding little salt. 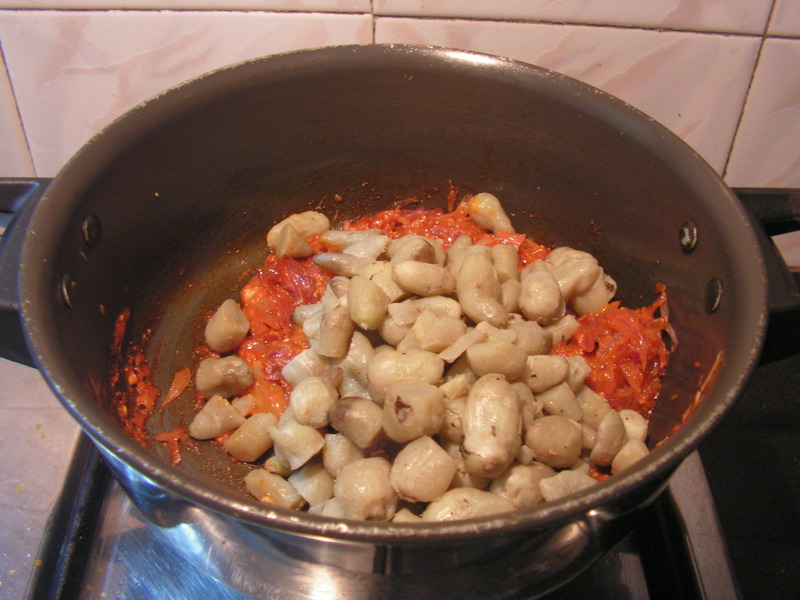 When done add chopped tomatoes and fry till mushy. 4. 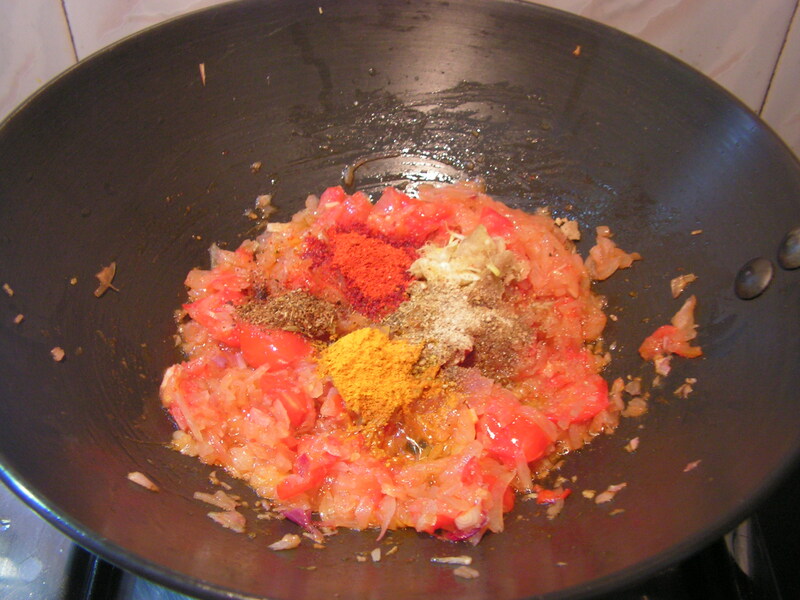 When done add all powders and ginger-garlic paste in a row and give a stir so that a pleasant aroma oozes out. 5. When done add chopped mushroom and capsicum and cook till done. 7. Transfer it to a serving bowl for a better view of the dish. Note:1. 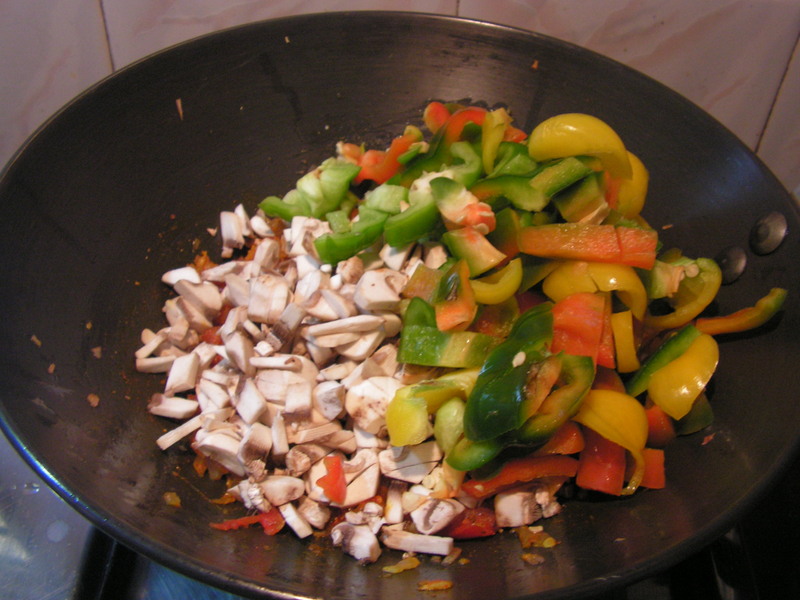 Use fresh veggies and mushroom for best results. 2. Do check for the chili powder you use for ideal spiciness you require. 3. One can even use frozen peas if fresh not available. 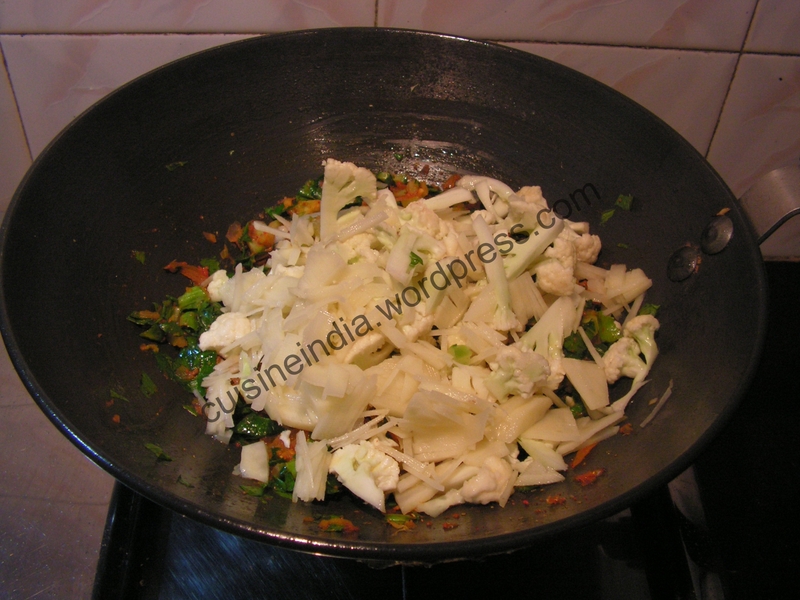 This entry was posted in Uncategorized and tagged Mushroom dishes, Side dish for Rotis. Chinese potato/kook/Sambrani in English, Konkani and Kannada respectively. Even though it can be considered as the close cousin of the king potato, it is available only for 2-3 months in a year. It is really healthy, generally and certainly for lactating women. We also prepare various dishes like the tikkies, upkari and today I would like to put up Kooka saung. It is a good combination with Konkani dalithoy , rice and papad. 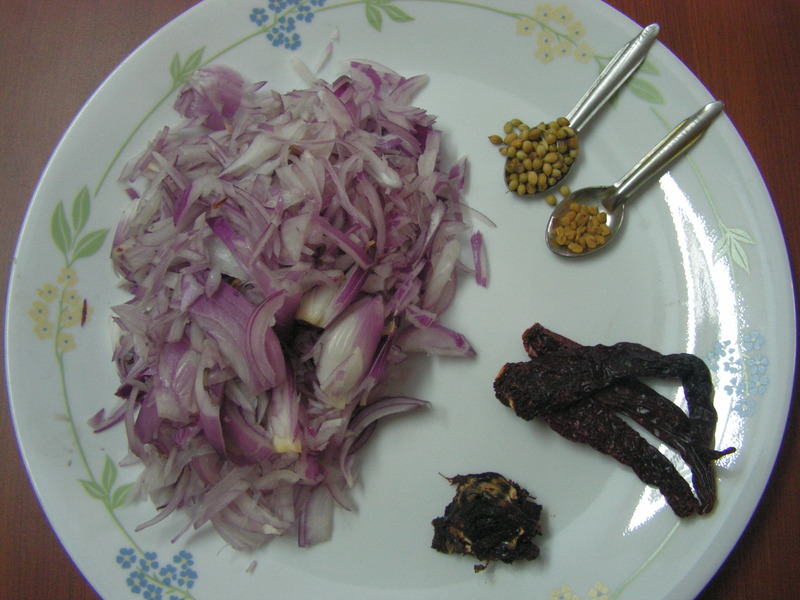 This is among the classical Konkani delicacies. 1. Wash and cook chinese potatoes in the cooker adding a little salt and water till soft. On cooling peal them and keep it aside. 2. Wash and peal onions lengthwise and keep it aside. Place a skillet with 2 teaspoons of cooking oil in it on medium flame. When heated add chopped onions to it adding salt to fry till transparent. 3. 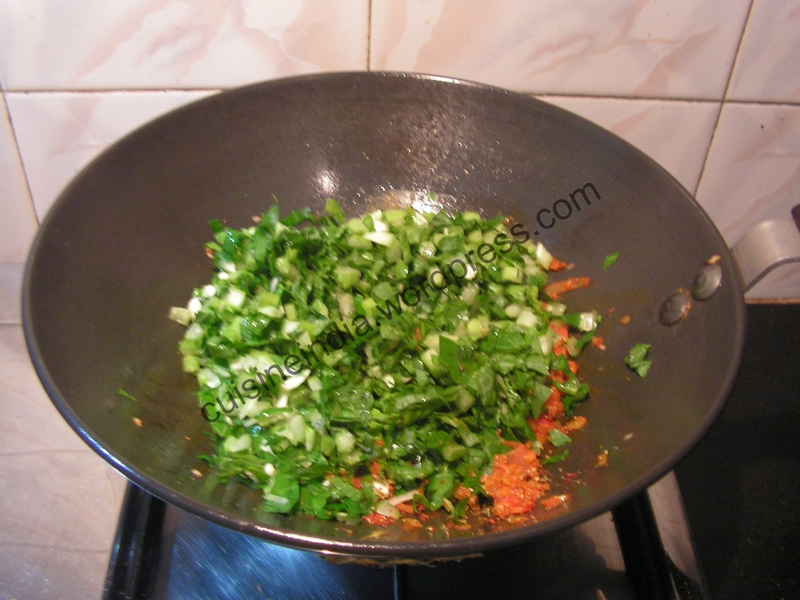 Place a spatula with 1 teaspoon of cooking oil in it and fry coriander seeds, fenugreek seeds and red chili in it. On cooling grind it with tamarind and a little water to a fine consistency. 4. 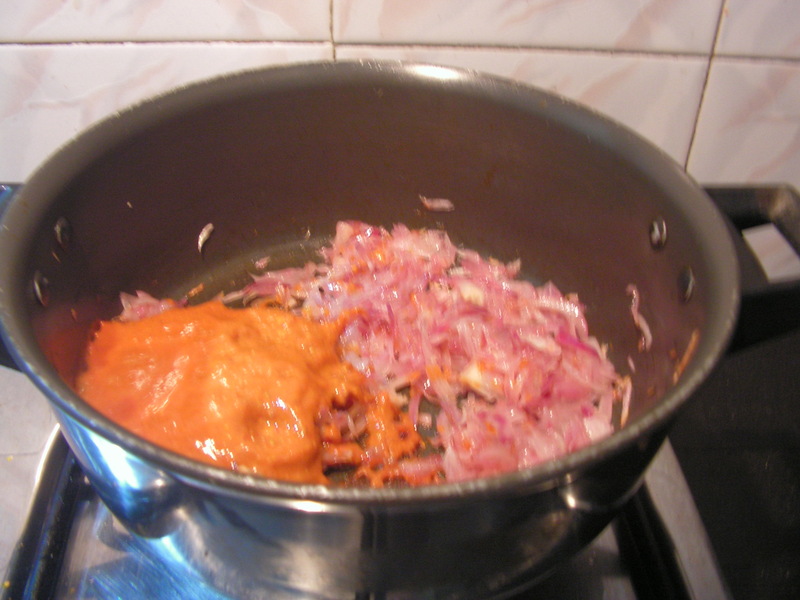 Add the wet masala to the fried onions and give a stir. 5. 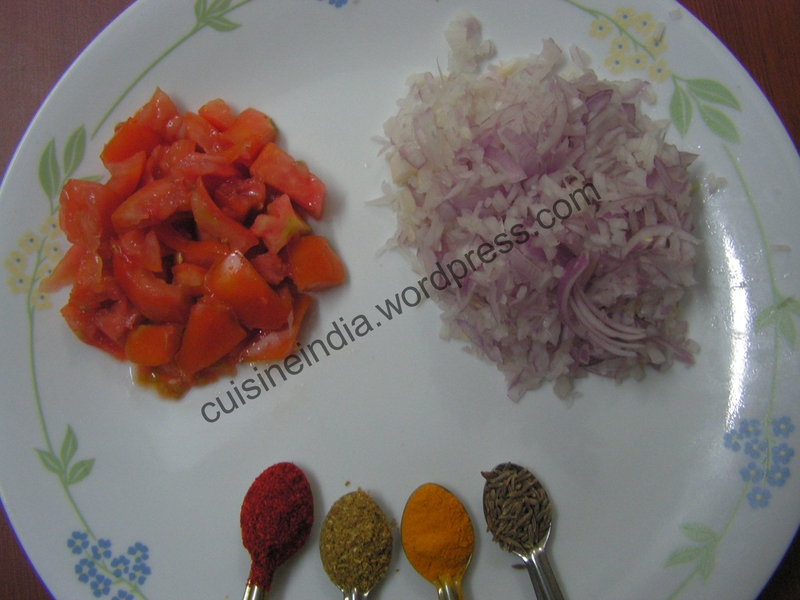 Add cooked and pealed chinese potatoes from step 1 to the Onion-Masala mix and give a stir. 6. Add a little water, check for salt and bring it to boil on low flame to incorporate the dish with the masala to make a homogeneous mix. 7. Transfer it to a bowl for a closer view of the dish. Enjoy with rice and dalithoy or even with Roti/chapati as well!!! 1. Fresh kook should be used for the dish for better results. 2. 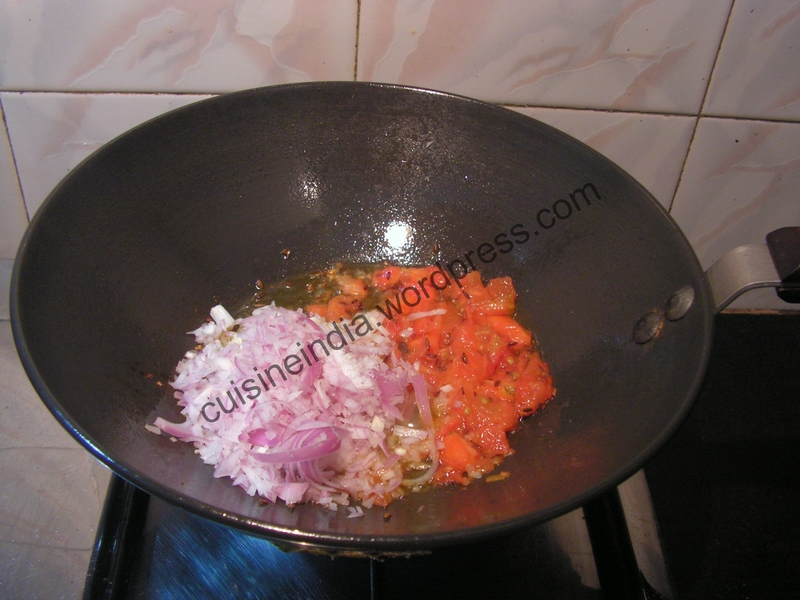 Onions should be chopped fine to get incorporated with the masala and the veggie. 3. People use coconut too in the masala which can surely be omited. 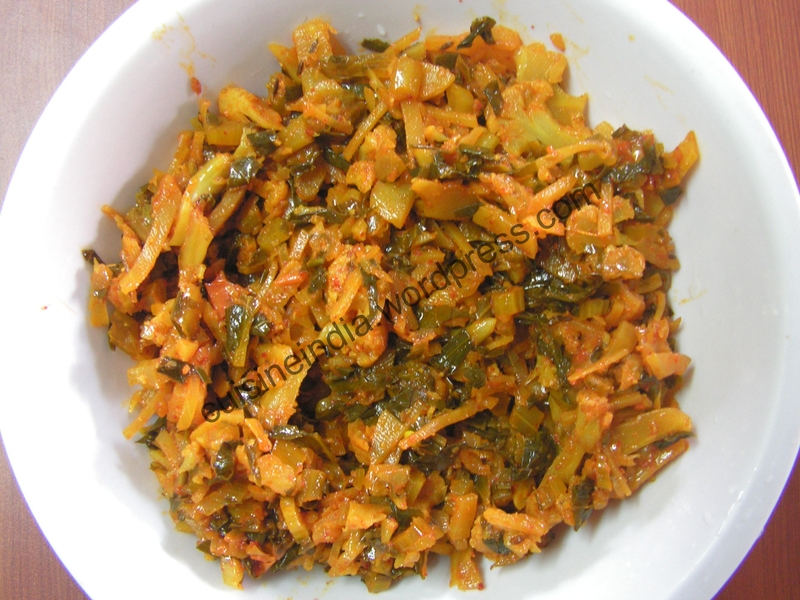 This entry was posted in Uncategorized and tagged Konkani dishes, Lunch side dish, Side dish for Rotis. 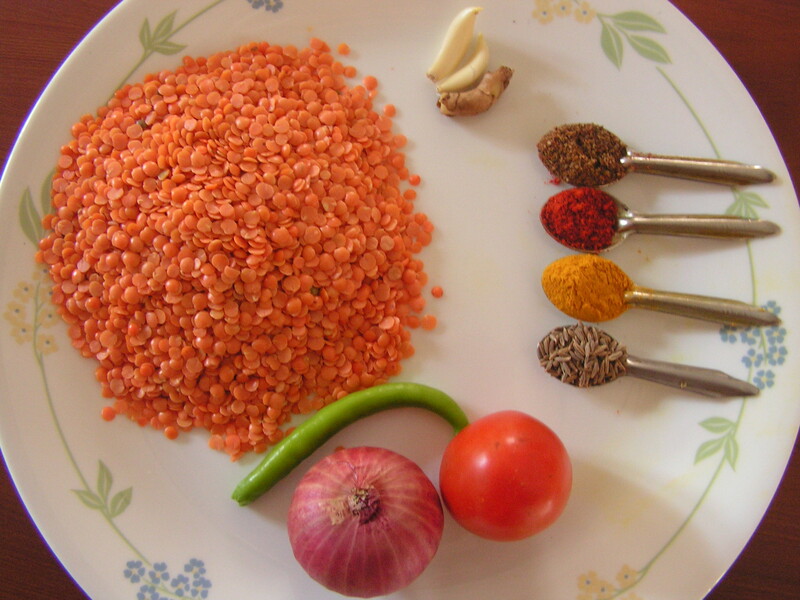 Masoor dal is more common in North India and in fact was not at all available in the south for a long time. 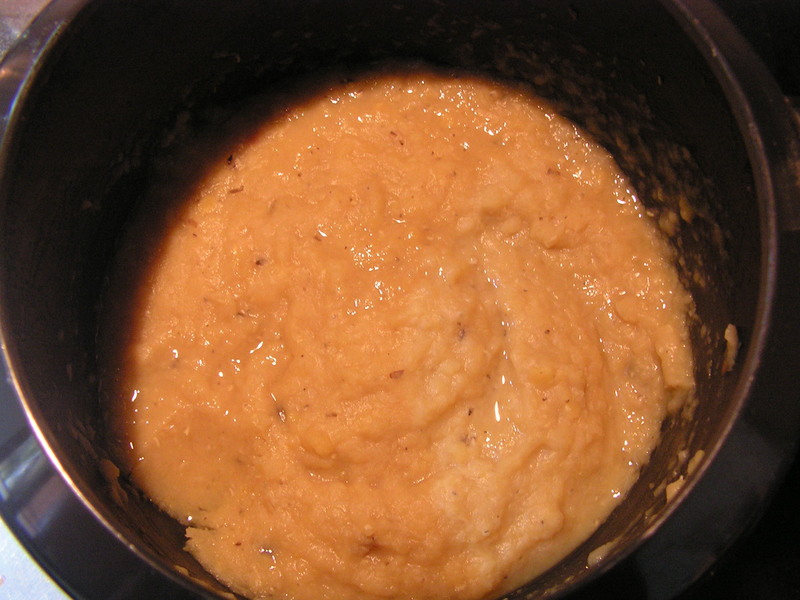 Masoor dal is orangish-pink in colour but turns yellow when cooked. 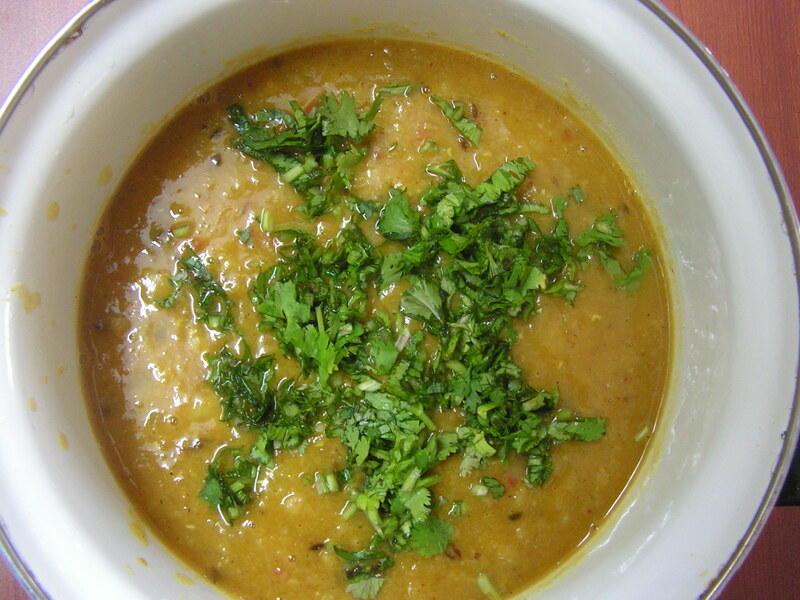 I borrowed this masala masoor dal recipe from my daughter-in-law – she had made it for lunch and both of us loved it. I add some spinach as a variation whenever possible. 1. Cook dal as usual in the cooker for about 20 minutes till soft. 2. Place a wide skillet with 2 teaspoons of cooking oil in it on low/medium flame. On heating add cumin seeds to it. When it splutters, add chopped green chili and also chopped garlic and ginger and fry till done. 3. 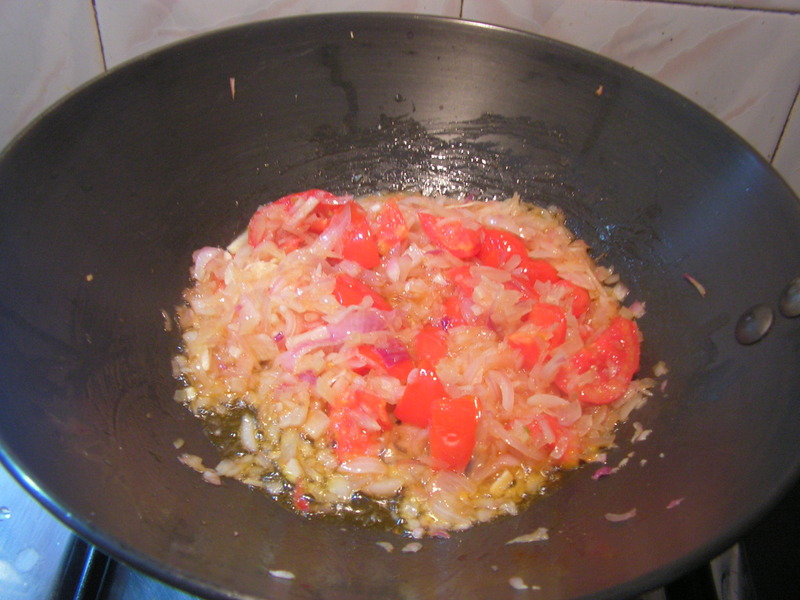 Add chopped tomatoes and onions together with required quantity of salt to it. 4. Fry till done and add all the powders mentioned above stirring throughout. 5. Finally add cooked dal from step 2 to it and bring it to the required consistency by adding water in steps checking for salt and bringing it to boil. 6. Thats it. Garnish it with chopped cilantro and I thought its best enjoyed with rice. 1. 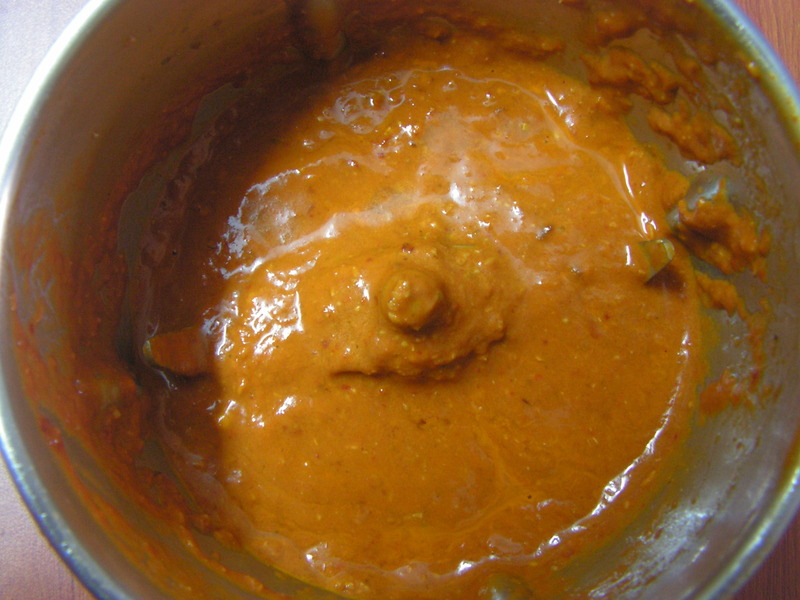 Dal should be cooked to fine consistency for best results. 2. One can even add 1/2 cup cooked palak for a variation. 3. This can be a side dish for rotis too. This entry was posted in Uncategorized and tagged Lunch side dish, Masoor dal Recipes/Dishes, Side dish for Rotis. A couple of days back I put up crispy fried cauliflower which was the more fun and snacky time. Now time for something more simple and wholesome – a stir fry with the cauliflower florets and greens ! Typically we tend to throw away the greens but this time I happened to buy a fresh Cauliflower with tender greens and so thought of adding them to the mix along with the flowerets. And I am glad I did ! You will too if you try this one. A great combination with Chapati/Roti. 1. 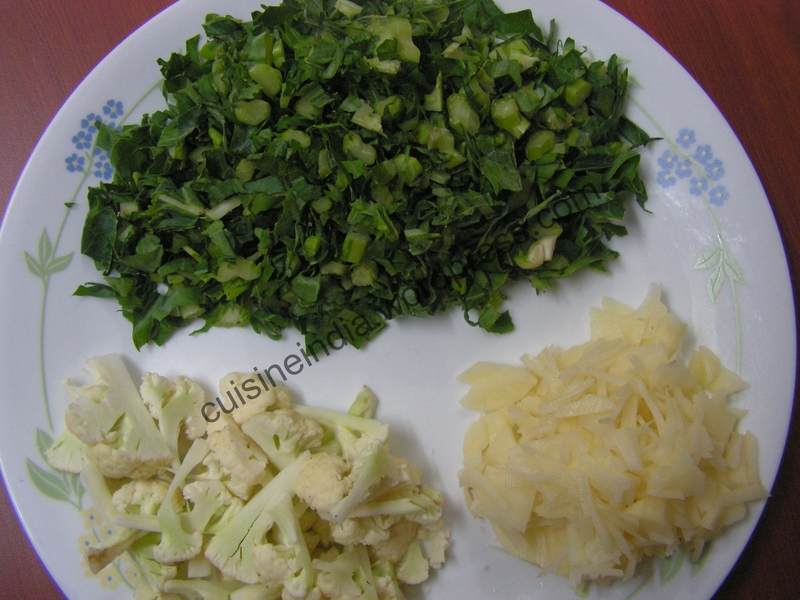 Wash and chop Cauliflower, its greens and also peal potatoes too and chop fine as shown in the image. Soak the flowerets and potatoes together and the greens separately in water for about 10 minutes. 2. 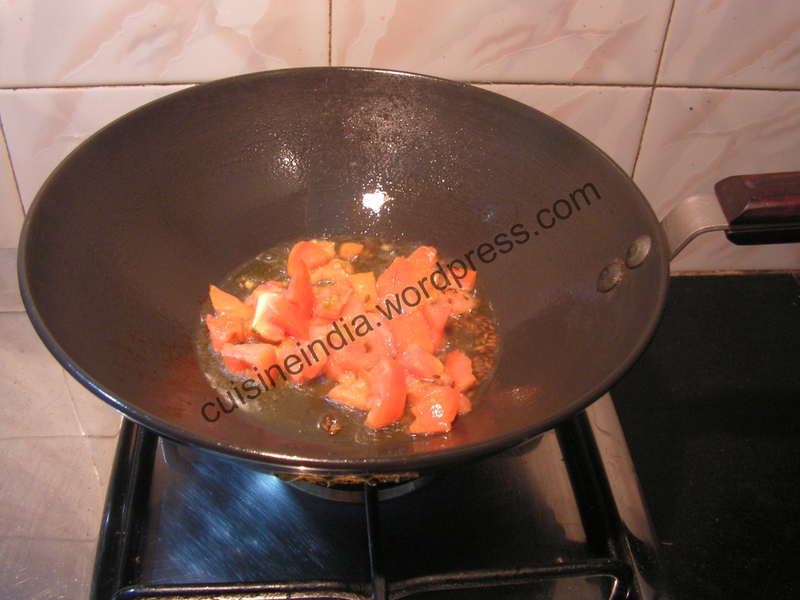 Place a skillet with 1 tablespoon of cooking oil in it on low flame. 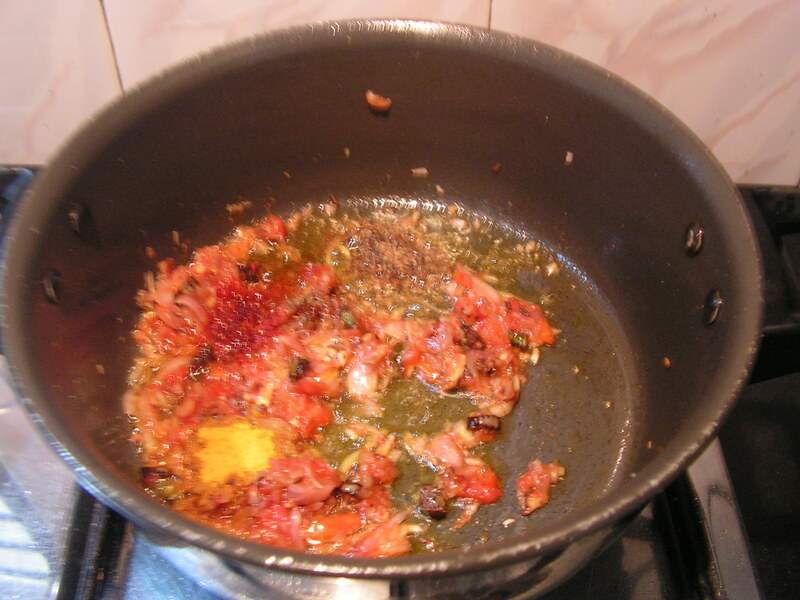 When heated add cumin seeds and when it splutters add chopped tomatoes to it and fry till mushy. 3. 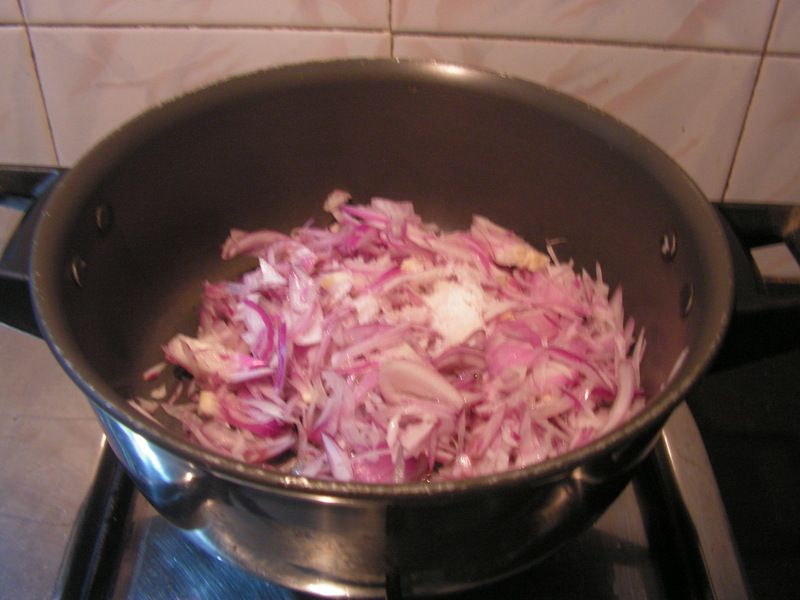 When done add chopped onions and required quantity of salt to it and fry till transparent. 4. When onions are transparent add all the powders. 5. When done, add chopped flowerets, chopped potatoes from step 1 to it and close it with a lid and cook till done on low flame only. 6. When done ready to serve and transfer it to a serving bowl. Enjoy with chapati or even roti. 1. The greens should be very close to the flower since it is tender . 2. 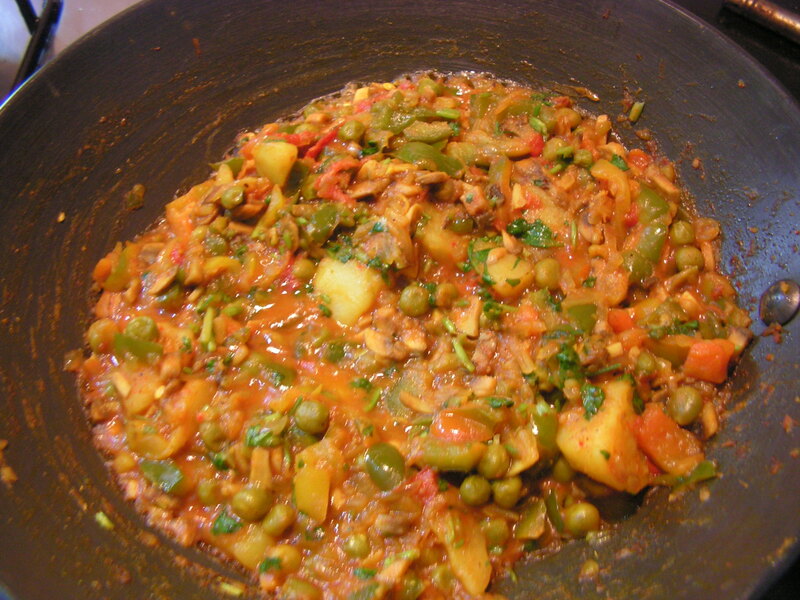 One can even use Green peas as a combination to the dish. 3. Since the greens take a little longer to cook it should be cooked intially and add the other veggies subsequently. This entry was posted in Uncategorized and tagged Side dish for Rotis. 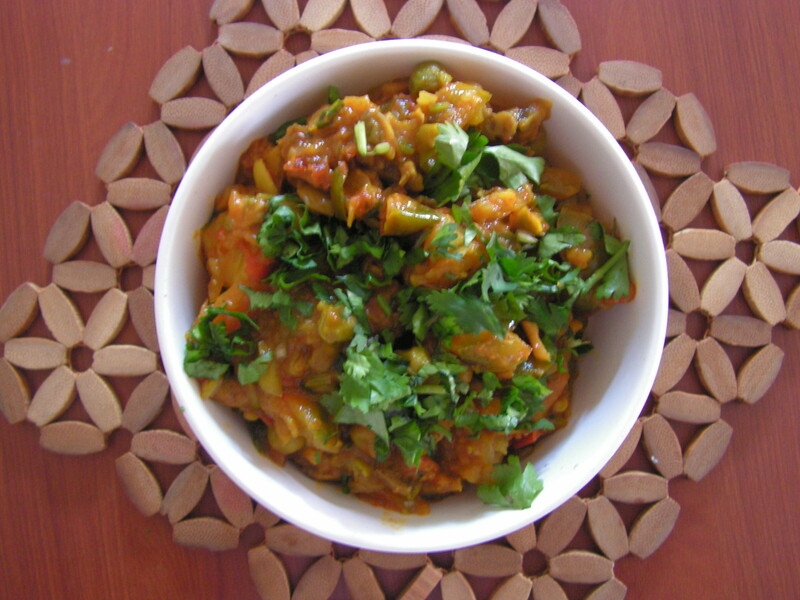 Bhenda / Okra is a popular vegetable in all Indian kitchens. This dish turned out so yummy that I now prepare at least once a week. I usually get tender okra from my maid’s garden – fresh and organic – and they look so good that I can hardly wait to enjoy them. This dish makes s a good combo with roti, chapati and also with dal rice and curd rice too. Here is my version of the dish. 1. Wash, peel and chop potatoes, sprinkle a little salt over them (prevents them from turning black) and keep it aside. 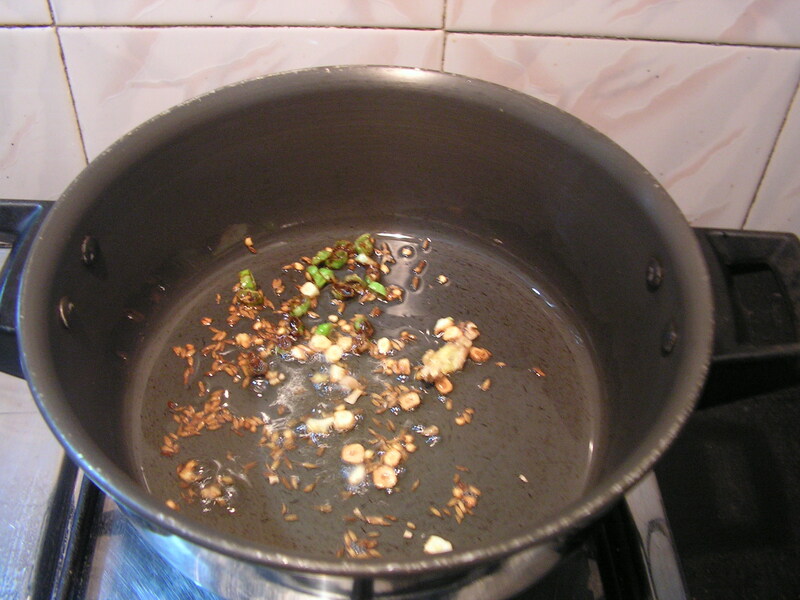 Wash and wipe okra with a clean cloth to dry and then chop it to bite size pieces and keep aside as shown in image-1. 2. Wash and chop tomatoes, cilantro. Also wash, peel and chop onions fine and keep aside in the above image. Place a skillet with peanuts on low/medium flame, dry roast till done and when cooled, peel and keep it aside. 2. Grind roasted peanuts, ginger, tomatoes, cilantro green chilly in the mixer adding water in steps to a fine consistency. 3. Place a skillet with a little cooking oil on medium/low flame and fry chopped potato in batches till a little crispy and keep it aside. 4. In the same skillet with the leftover oil, add chopped onions from step-1 to it and fry till transparent (adding required quantity of salt). When fried add dhania-jeera powder to it. 5. When fried add grind wet masala, chopped okra and a little water to it cook till smooth. Use wooden spatula so that tender bhendi does not get crushed on being cooked. 6. 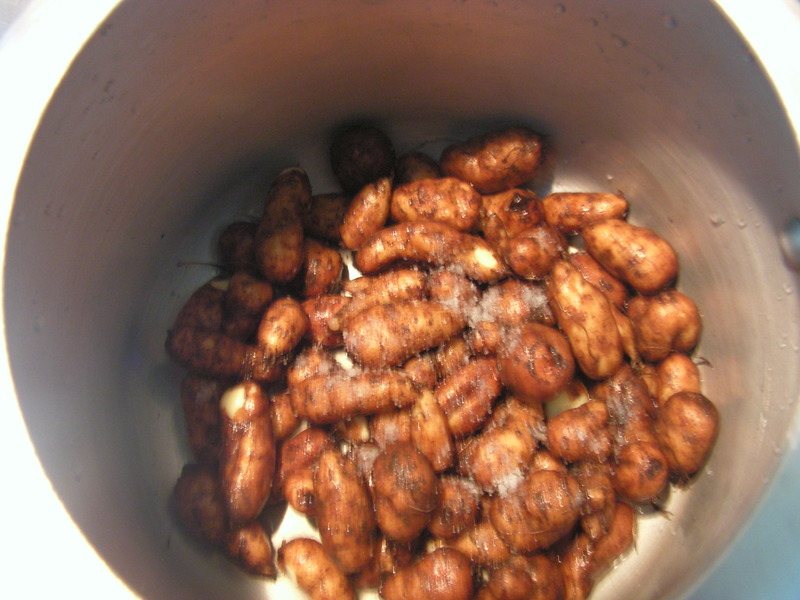 When done add fried potatoes from step-3, check for salt and then stir in well. Allow it to thicken. 1. Use fresh and tender okra for the dish. 2. 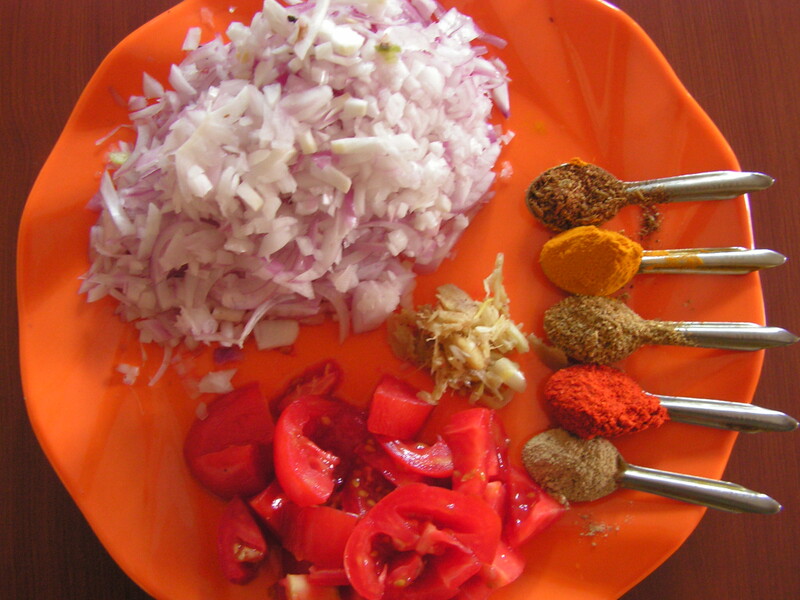 One can even add raw peanuts for the masala while grinding. 3. 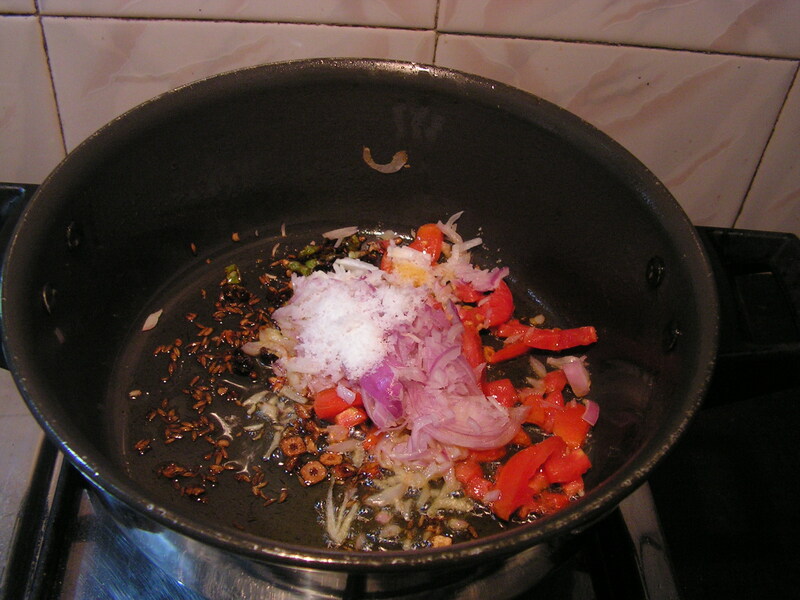 Cook the dish on low flame only as it is likely to get crushed on high flame. 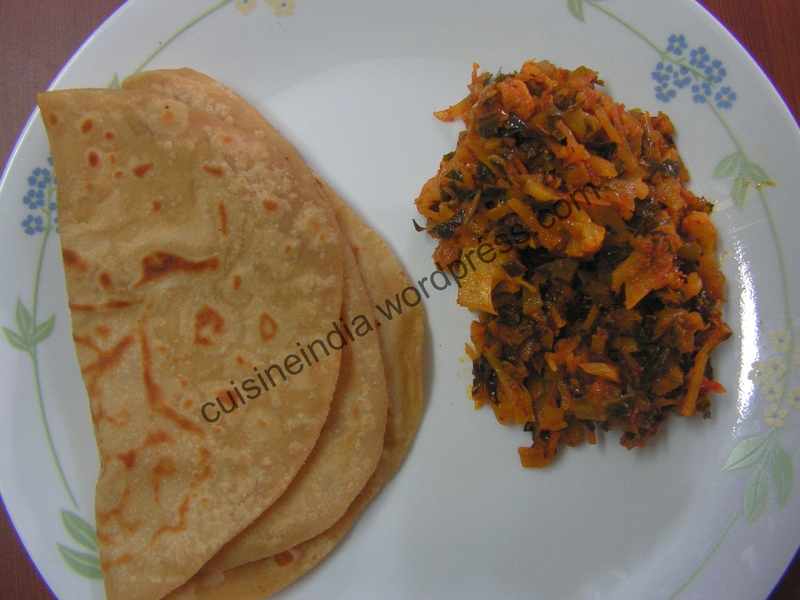 This entry was posted in Uncategorized and tagged 45 minutes, Lunch side dish, Okra, Side dish for Rotis. The season for Avrekalu/Surthi Beans is drawing to an end, and I have a few other recipes that I will keep for the next season. 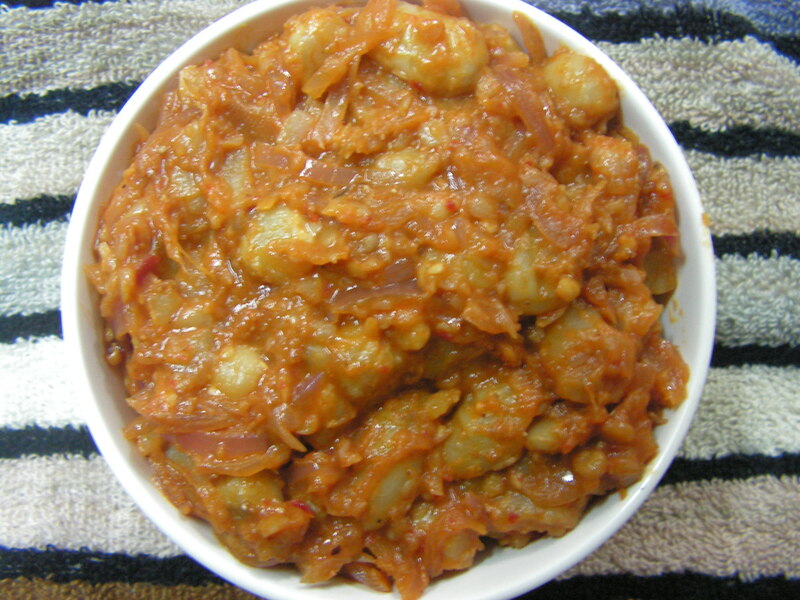 This recipe for avrekalu usli is an easy one for beginners and yummy one too. Only thing it specially requires is a little patience to peel it doubly. This dish can be relished as a tiffin and also can be a luch side dish with rice or with chapati and jwari roti too. 1. 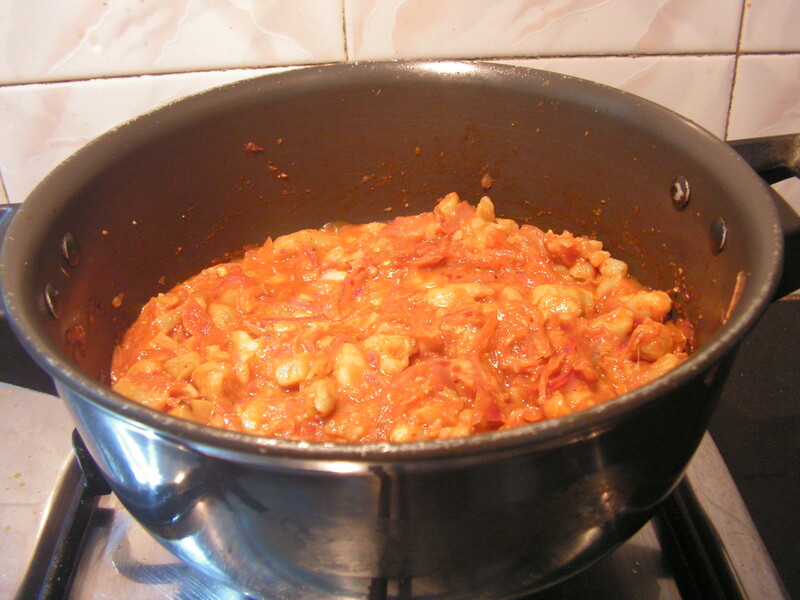 Cook double peeled surthi beans (hithukubele) in cooker adding a little water and salt till fine and keep it aside. 1. Fresh avrekalu should be used for better taste. 2. Double peeling is a must for this dish. Else it will not be tasty. 3. Some people add onion in place of cumin. 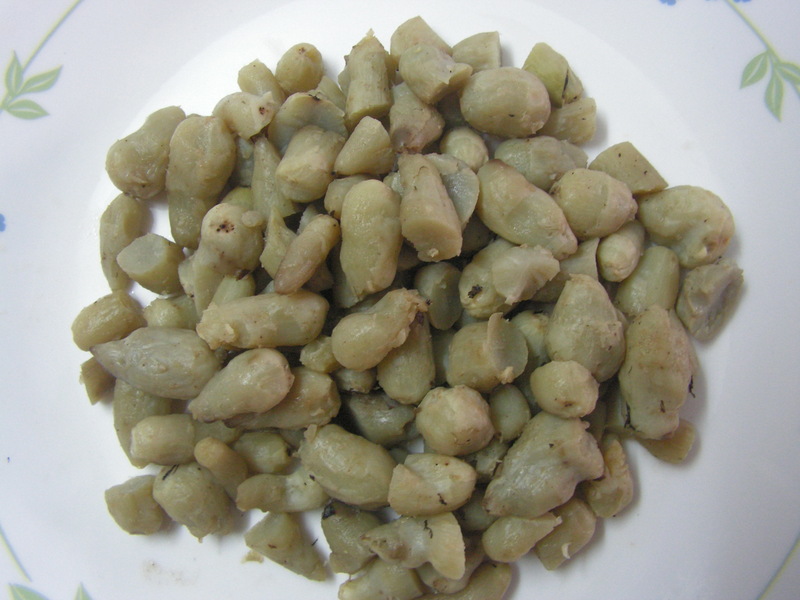 This entry was posted in Uncategorized and tagged 45 minutes, Avrekalu/surthi beans/hyacinth beans dishes, Lunch side dish, Side dish for Rotis.